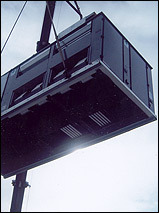 Today's homes do an excellent job of sealing in heated and cooled air to improve energy efficiency. Unfortunately, airtight homes also trap contaminants - mold, bacteria, dust and pollutants - that can cause flare-ups of allergy symptoms and even trigger asthma attacks. 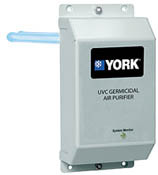 The York Affinity Ultraviolet Germicidal Light (UVC Light) works to clean your indoor coil and prevent mold growth by destroying the DNA, thereby killing or deactivating the spores. As a result, when the York UVC Light is used in conjunction with a York high-efficiency air cleaner, the conditioned air circulating through your home is cleaner and fresher, while the inside of your system stays cleaner for maximum efficiency and performance. This premium UVC high output, low temperature duty germicidal light is designed to provide maximum dosage of UVC energy at 45 to 55 degrees Fahrenheit in a rapidly moving airstream. This premium UVC germicidal light uses a blend of inert gases in the bulb and a specialized power supply that maintains the optimal plasma temperature inside the bulb even in a low temperature, moving airstream. The mixture of gases creates a bulb which does not produce UV with wavelengths of less than 200 nanometers. This premium UVC germicidal light does not contribute to ozone production. UVC germicidal light comes equipped with indicator lights on the front panel of the power supply housing that will change from blue to yellow to remind the consumer to contact the installing contractor to change the germicidal light. When the indicator light turns red, the lamp assembly must be replaced to maintain the highest level of performance.